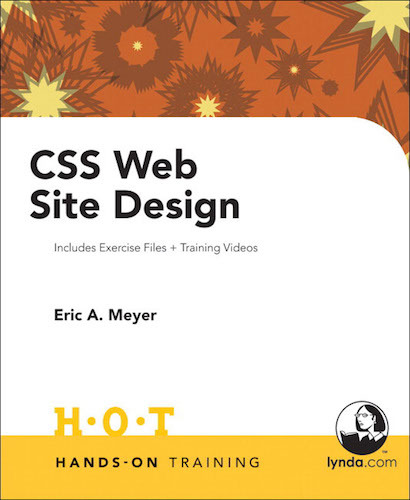 Hands-on exercises, complete with insider tips and detailed color illustrations, teach you the latest techniques for designing Web sites with CSS (Cascading Style Sheets). CSS gives you control over the appearance of your Web sites by separating the visual presentation from the content. It lets you easily make minor changes to a site or perform a complete overhaul of the design. In CSS Web Site Design Hands-On Training, you'll start with a review of CSS essentials, learn to build effective navigation and page layouts, and then move on to work with typography, colors, backgrounds, and white space. The included CD-ROM is loaded with classroom-proven exercises and QuickTime training videos, and real-world projects take you through the Web page creation process, one step at a time. If you prefer to hold a book in your hands before deciding to buy it, some chains like Borders are carrying the title (as they do most O'Reilly books). You could also try ordering it through your local neighborhood bookstore, which would no doubt appreciate the patronage. You might have to wait a few days for it to come in, but it's a small price to pay for supporting community merchants.